We're all familiar with the greats of the sport, but which countries can boast the best record on the track? Select Car Leasing analysed how many drivers from each country have taken part in F1 and WRC and compared that total to each nation's population size, per every 1m citizens. The stats revealed some big surprises. When thinking about which drivers and countries dominate motorsport, some of the first people to come to mind are Germany's Michael Schumacher, the UK's Lewis Hamilton and France's Alain Prost. 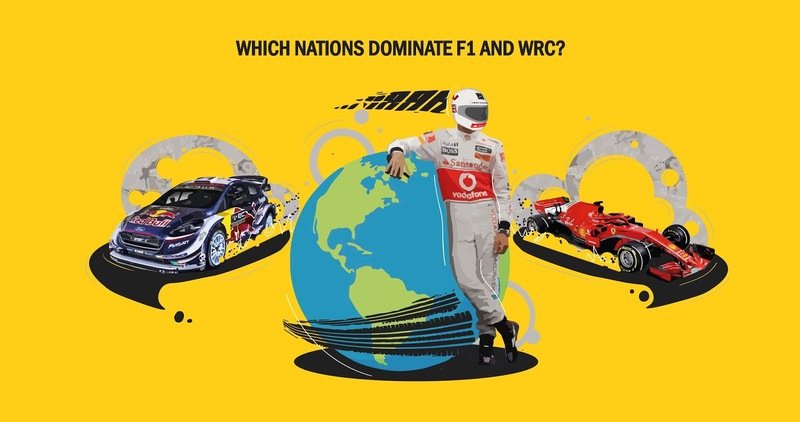 However, while these drivers have helped establish significant interest in their countries, there are several smaller nations that continue to contribute to the Formula 1 (F1) and World Rally Championship (WRC) circuit. These have made a massive impact on both sports and created huge excitement in some of the world's lesser-known provinces. At Select Car Leasing, we wanted to make sure the little guys aren't forgotten. *All population data is from 2017 except Rhodesia (1978) and East Germany (1990). The UK, US and Italy have dominated the circuit since F1's inaugural year in 1950, featuring a combined total of 418 drivers. That figure is nearly half of the overall total of drivers that have taken part in the competition, which currently stands at 853. This perhaps isn't surprising given the size and the relative popularity of F1 in these countries. However, when looking at participation rate compared to population the true hotbeds of the sport are revealed, with Switzerland steaming ahead of the competition, having had 2.9 drivers for every 1m citizens. 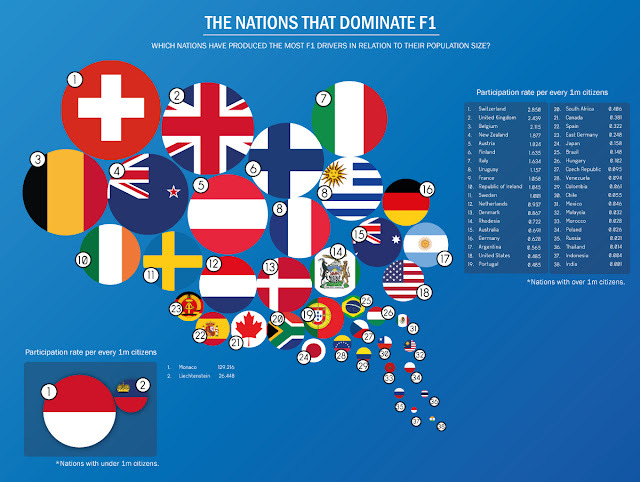 Europe enjoys huge dominance for participation, with eight of the top ten nations from the continent, demonstrating that F1 still has some way to go before becoming a truly global sport. The United Kingdom isn't far behind the Swiss with 2.4 drivers for every 1m citizens and it's followed by Belgium and New Zealand. Monaco has a very large participation rate in F1 with a total of five drivers competing in its history, despite only having a population size of 39,000 people. China and India have a combined population of 2.7 billion citizens but have only had two drivers take part in F1 between them. Out of a total of 40 nations that have competed in the sport, only 13 of these countries are home to a drivers' championship winner. The undeniable kings of F1 are the UK and Germany, with a combined total of 32 championships out of a possible 69. There has also never been a nation of under 5.5m citizens that has won a championship. Finland remains the smallest country to have produced a driver which has claimed this coveted prize. 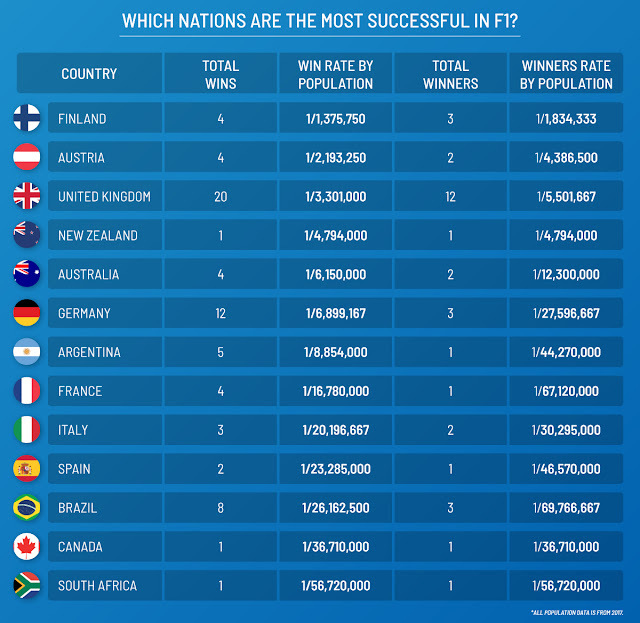 Which Nations are the Most Successful in F1? *All population data is from 2017 except Soviet Union (1991), West Germany (1990), East Germany (1990) and Yugoslavia (1991). 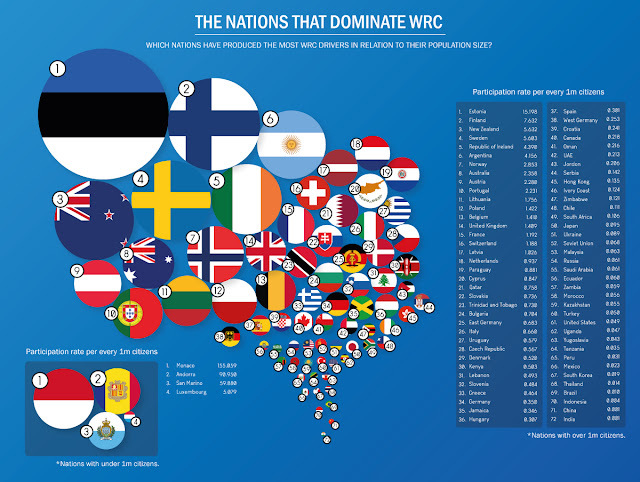 Understandably, WRC is very popular with Scandinavian countries and any nation which endures harsh winters. Finland, Sweden and Norway all feature in the top 10 of participants. The alpine slopes and harsh conditions in these countries make them excellent proving grounds for rally drivers. After only winning one WRC Championship in their history, France has now won the previous 15 in a sport largely dominated by Finland. 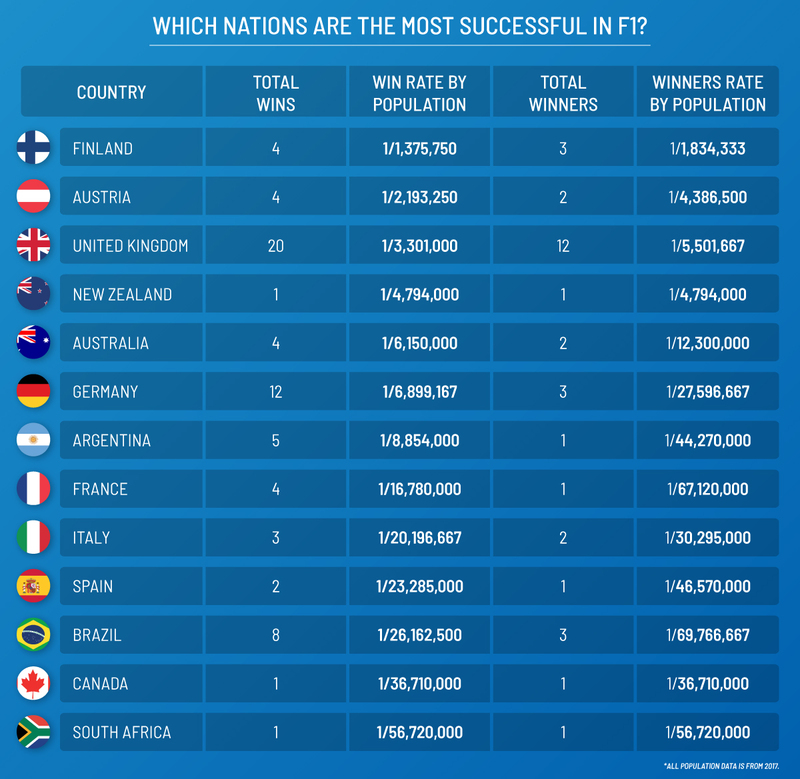 Although France now has 16 victories compared to Finland's 14, Finland is still streets ahead of the competition in terms of win rate by population, with one victory for every 400,000 citizens. In the UK, interest is perhaps directly reflected by skill level in F1 and WRC, with the former enjoying much better coverage and support across the British Isles. 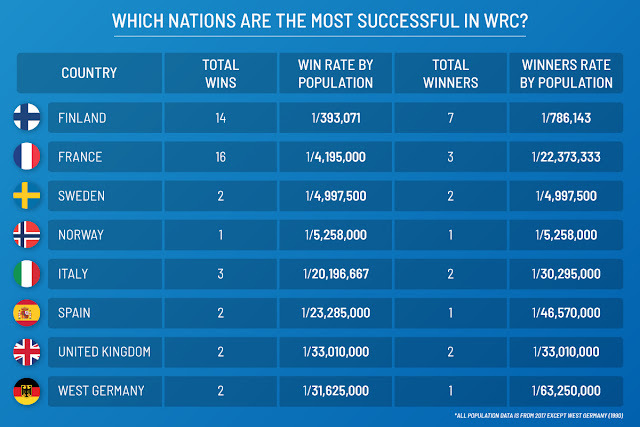 As a result, one in 5.5m people in the UK has won an F1 title, in comparison to a staggering one in 33m for WRC. Since being reunified in 1990, Germany has not had a winner of WRC despite West Germany winning twice in the 1980s. Which Countries Dominate Both Motorsports? Intriguingly, the overlap between F1 and WRC seems relatively minimal. Only five nations have won a title in both; the UK, Finland, Italy, Spain and France. While F1 and WRC draw many similarities and often similar audiences, it's clear that the sports enjoy markedly different support bases across the world. And participation rate doesn't always quite match up with wins, Estonia and Switzerland lead the way in the respective sports but neither has ever claimed a championship victory. If you would like to know more about the influence of certain nations in motorsport, Select Car Leasing have you covered. Our previous piece focused on the contribution of Finland to motorsport and showed how they are consistently punching above their weight for their population size. It's available to view here.